Former minister of Education and foremost campaigner of the Bring Back Our Girls group, Mrs. Oby Ezekwesili has reacted to Goodluck Jonathan's response to The Guardian UK's report on rescuing the abducted Chibok girls. Madam Oby's tweet is coming following the former President’s reaction to the report by a British newspaper that the British armed forces’ offer to attempt to rescue the girls were rebuffed by then President Jonathan. In a statement signed by Ikechukwu Eze, media adviser to Jonathan, the former president confidently said that the lies in the report are self evident because the international press as well as the Nigeria media actively covered the multinational efforts and collaboration which involved some of the major powers deploying their crack intelligence officers to work with our own security operatives. He said Jonathan's supportive that the foreign powers involved were granted permission to overfly our airspace, while conducting the search and rescue missions. 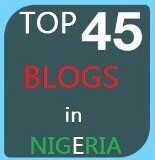 But Mrs Ezekwesili said: “what a response. The people of the world who joined in crying out for responsiveness can read between the lines. 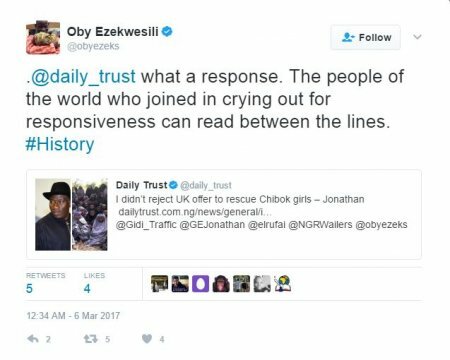 #History”, quoting Goodluck Jonathan's rebuttal claims on the Chibok girls' rescue.